Frankly, I don't think I've ever looked better. Happy Halloween from my ghoulish gang to you and yours. The following is what occurred when I attempted to take the quintessential fall-and-pumpkins photo of one three-year-old and two 12-month-olds. Honestly, after a year of this, I really should know better than to even try. I had slightly better luck when I separated Isabella from the twins. I managed to capture this, where Nicholas looks great! Sadly, Luci looks...drunk. Then there's this one, where Nicholas is either declaring the pumpkin to be tres magnifique, or is trying to figure out how to flip his sister the bird. I have nothing witty to say about this one of Isabella. Considering she is photo-phobic 98% of the time and generally runs from the camera screaming, this is a pretty decent photo of her. This is probably the best of the bunch. No one is looking at the camera, but no one is crying, tipping over, or crawling away either. 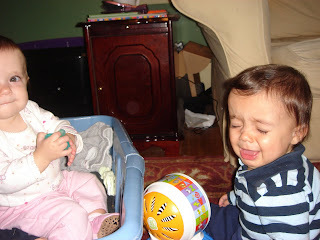 One of these days, it will be possible to take a decent photo of my three children together. In the meantime, I think it's high time I learned to use Photoshop. The annual Christmas photo shoot is coming soon, after all. If you've read here long enough, you know my extended family thinks I am Captain of the Food Police. Quick refresher for any of you new to IW: I feed Isabella and the babies mostly organic food, sweets and treats are not an everyday thing but instead a once-and-awhile thing in my house, and healthy nutrition is a big deal to me. I am more concerned (those related to me would say obsessed) with what my kids eat than most people I know, but I am also completely unapologetic about it. I don't judge the way other people feed their kids, and I expect the same respect from them (of course, I receive nothing of the sort from my own family, but I digress). So, it was interesting to read this article, which Sasha recently posted to FB. Sasha mentioned in an email to me that most of the people in her city (she lives in Boston) don't let their kids go trick-or-treating, and if they do, they abscond all but five pieces of their candy. I must admit that I laughed when I read her email, because honestly, I think I ought to live in Boston, because Bostonians sound like my kind of people. Now, of course I am letting Isabella go trick-or-treating. I did last year (the first year she was old enough to really grasp the concept) and she had a blast. I would never deny her that experience. But I will also readily admit to giving away 95% of her candy to the hubs and his students. I let her have one piece of candy a day for a week or so, and then that was it. She didn't ask for it, and frankly, at barely two-years-old, she didn't even miss it when it was gone. I realize this may be an unpopular opinion, but I don't see any reason for a two-year-old to have more than one or two pieces of candy a day. I realize I am not going to be able to get away with quite the same degree of subterfuge as I did last year. At three, she is very aware of the things I buy when I go food shopping, and our new house has many more kitchen cabinets than did our old house, so she knows where food is located now too. I know she will ask for her candy, and I know she will not always like my answer. But I plan on handling her Halloween booty the same way this year. She can have a piece a day for a week or so, and then the rest is being given away. If only people gave away cakes and muffins instead of candy. I don't like chocolate, so a bag of Halloween candy is virtually no temptation at all for me. 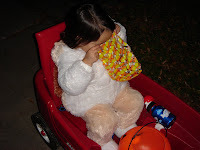 The Babble article offers a lot of great suggestions for dealing with Halloween candy in little-to-no-candy households, including talking about Halloween more in terms of costumes, parties, and pumpkins than in terms of candy, limiting trick-or-treating time, and educating your kids about why candy is not good for their bodies. Since Isabella is obsessed with her dentist, I plan on telling her that Dr. Kelly says that candy isn't healthy for her teeth. Am I the Grinch of Halloween? Maybe. My family certainly thinks so. But I also want all three of my kids to grow up with healthy eating habits, something I did not, mainly because of my childhood illness and overall picky ways. I'm curious. What is the Halloween candy policy in your house? Isabella has had a wonderful month, in what has most decidedly not been a wonderful month for the rest of us, what with the stress of the move, my new teaching gig starting, and the everyday insanity of life with twins and a three-year-old. 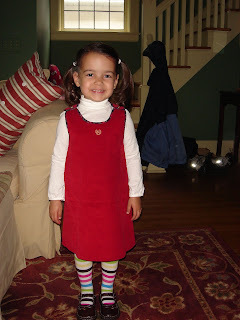 She has her moments, as all kids do, but seriously, she has breezed through the transitions to preschool, to her new house, her new room, and the various other small upheavals that have been thrown her way. Thank you, baby girl. Mommy needed this. Isabella loves preschool. Actually, "love" isn't strong enough of a word. She adores it. She's excited to go every Tuesday and Thursday morning, and barely notices when it's time for me to leave her in her classroom because she's so absorbed with rolling Play-doh or threading string through cardboard. When I pick her up from school, she comes running toward me (dismissal is via the playground) yelling, "Mommy! Mommy!" with a huge smile on her face, and she cannot wait to show me the art projects in her bag. I am kicking myself for not enrolling her in the three-day program. She would have done just fine going three days instead of two. We'll definitely do three (or more) days next year. Her new room (which is palatial in comparison to her old room and also when compared to any bedroom that I've ever called my own-I think it was actually the master bedroom at one time, and my bedroom was added on at some point) is lavender, and Isabella keeps telling me she does not like lavender and wants the room painted red. She is definitely more of a primary colors girl than a pastel girl. But painting her bedroom red scares me a little. I'm planning to paint our living room and kitchen brick red, but I don't think this color will work for a bedroom. We'll have to work on a compromise (not pink) so she can have a room color she likes and I don't have to shade my eyes every time I walk into her bedroom. Drawing and painting are definitely her passions, and it's been very cool to see her work evolve over the past year from scribbles to lines to circles to actual, recognizable objects. She draws a pretty decent sun, dogs with exceptionally long tails, and even faces with eyes and mouths. And she is very, very proud of the paintings and projects she creates in preschool. Isabella will not let me give any of them away, even to her most favorite relatives. She wants each of them mounted on a corkboard on the back of the basement door. I want to get something like this and hang it on a wall in my kitchen. Anyone ever do something like this for their kids' artwork? Or something different? Now accepting suggestions! We've had a lot of fun doing fall-related activities, including apple-picking, visiting some local farms for cider and doughnuts, and a hayride to a pumpkin patch for gourd-and-pumpkin- picking with her preschool peeps. Isabella's had a blast, and I've decided that three is my most favorite age yet. She's having so much fun, learning a ton, (Isabella: "Are there seeds in gourds like there are in pumpkins?" Me: "Uhhhh...let me get back to you, okay? 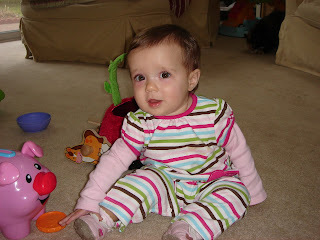 ), and is fun to be around (except when she pulls out every bedtime procrastination tool in the book). I only wish I had more time to spend one-on-one with her. The twins are so high-needs, and now that they're basically mobile, I can't leave them unattended for much longer than 30 seconds, so they're getting 90% of my attention. It's my goal this month to find time for her. Yes, my life is insanely busy with work, unpacking, and trying to keep my head above water, but as so many of you have told me, my kids are only going to be little for a very short time. And I need to enjoy the essence of my amazing daughter as much as I can while she's still willing to let me. 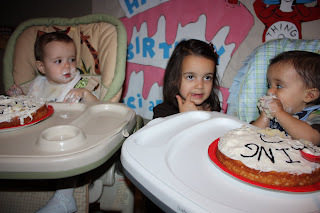 The twins turned 1 last Thursday. The house was (and really, still is) an utter disaster of unpacked boxes, misplaced furniture, and mountains of toys that needed to be stored and organized, but we tried to focus as much as possible on the birthday babies, and the long, crazy journey of the past year. 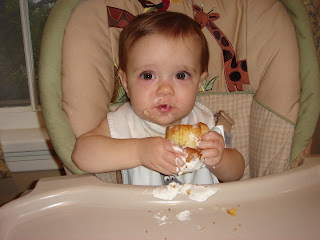 Isabella started a rumor early in the day that there would be cupcakes served after dinner. Given the infrequency of treats in our house, this was a big deal for all three kids. So seriously. The word on the street is that we're getting cupcakes tonight. Care to confirm or deny? 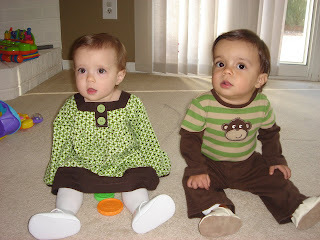 First, we stripped them down and sang to Luci and Nicholas individually. Not loving off-key "Happy Birthday" rendition. Make fun of my pink and purple bunny bib, and I will crush you like cupcake. Dude, you're supposed to eat it, not smash it. Boys. We had their party at the new house on Sunday. All 35 of our guests fit in the house comfortably, which was a big relief. Something is going on. We're just not quite sure what it is yet. Behold, my sister's masterpiece for their "Thing 1 and Thing 2" party, which she sent from Seattle. What? I didn't mention that we often call Nicholas "Nico"? Now you know. Isabella's smash cake took me approximately eleven-hundred hours to make and decorate. I made the cake from scratch. I made the frosting from scratch. I piped 500,000 little flowers on it, which took her less than 60 seconds to obliterate. The twins? Got the best Pillsbury had to offer. Fortunately, they didn't seem to notice the difference. Come near our cakes and you will lose that finger. Frosting in nose is saved for later. Please do not remove. And the cake for those not eating with their fingers, which I did not make, from a box or otherwise. 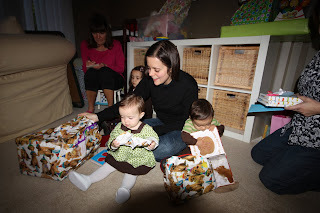 Just like Isabella on her first birthday, Luci and Nicholas were pretty uninterested in the present-opening, and much more interested in eating the books and playing with wrapping paper. Isabella, however, rediscovered her inner one-year-old and was more than happy to take over tearing into their toys and playing with them. These kids have spent the last year seriously kicking my arse. They are not easy babies. They still cry and fuss a lot. And they still do not like to sleep. But oh my goodness, they are a whole year old now, and I know (I just know) it's going to get easier from this point forward. The birth of every baby changes his or her mother's life forever. Babies bestow their mothers with tremendous responsibility, incredible joy, and an all-encompassing love the likes of which most women haven't experienced before. But the birth of two babies at once? Your birth one year ago today was at once double the joy and double the love, but also double the fear that I was simply not up to the task of giving you everything you needed. There was nothing in this world that could have prepared me for your arrival, and for the happiness you have brought to our family. 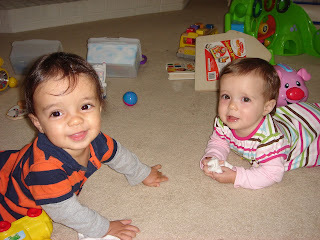 into still-small but growing-by-the-day, rolling, crawling, babbling little people. You are twins, born a minute apart at 3:09pm and 3:10pm this afternoon, but you are so very different. Luci, you are my feisty, fierce, and independant little spitfire. You are definitely more dominant than your brother, more physically aggressive (you enjoy pulling his hair, stealing his toys, and swiping his beloved binky constantly, and then laughing when he cries), and more willing to play on your own or with your big sister. 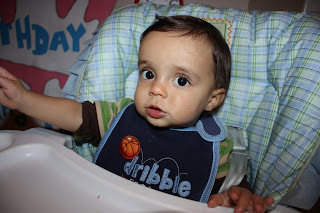 You adore your 81-year-old great, great aunt, Happy Baby Puffs, and any toy that allows you to toss or pound objects. 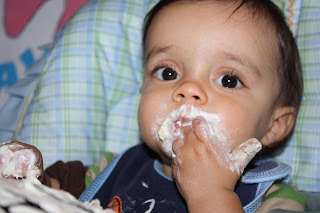 Being kissed ranks right up there among your favorite activities, while trying new foods is probably your least favorite (in this respect, you couldn't be more different than your brother). You love making huge splashes in the bath, slobbery kisses, and rolling a ball back and forth with Isabella. I'm going to assume your teeth are hiding somewhere in your gums, because you're still my toothless wonder, just as your big sister was at 12 months old (and 13 months old, and 14 months old). Frankly, since I'm still nursing you and your brother, this fact doesn't bother me in the least. Nicholas, you are the very definition of "Mama's Boy." You would like nothing more than for me to carry you around all day long, and you cry so pitifully whenever I set you down. Books and music are your favorites. You love to lie on your back, "reading" a book that is supported by your feet, and you seem to have a rhythm that no one else in the family has, as you shake and bop your head along to any music you hear. You are more passive than your sister, and you let her be the boss. You are outnumbered in a house of dominant females, but you seem to take this fact in stride and not retaliate against your sisters' aggressive behavior. Snuggling has always been important to you, but since you've learned to crawl (just on your belly so far) you seem to want this a bit less. Thankfully, you've decided to use your two teeth for good instead of evil and you've stopped biting me. Thanks, little man. Overnight, I went from the mother of one to the mother of three. 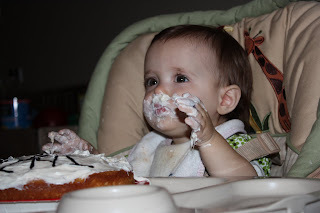 It wasn't an easy transition for me, and frankly, I'm looking for my own cake and ice cream today for surviving the first year of being your mommy. But along with your challenges, you have also taught me some important lessons. I have become less critical of myself, my mothering abilities, and even a tad less tightly wound than I was before you were born. 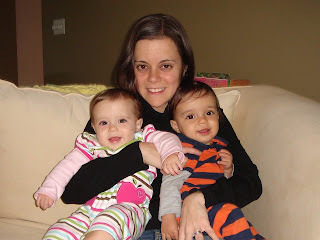 I've realized that there is no "perfect" in mothering multiples, and I'm actually okay with that. The fall is by far my favorite season, and in our little corner of the world, autumn is beautiful. The leaves change color and the pumpkins are out in abundance. It's apple cider time and apple-picking time. The days are comfortably cool and the nights are even cooler. There are so many opportunities for fun, fall-themed birthdays. Truth be told, I've always wanted an October baby. One year ago today, my wish was granted. Times two. 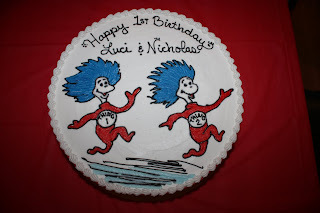 Happy birthday, Luci and Nicholas. You've changed my life in innumerable ways, and I can't wait to see where life is taking us next. The move was...interesting. I do not advise moving yourself, especially when "yourself" is really you, plus partner, plus three small children. If I had to do it again, I would have used movers to save our friends and family the hassle of lugging furniture and boxes into our house in the pouring rain until midnight on Friday, and then all day on Saturday. As you can see, I was a blubbering mess the entire weekend. Each time we took a trip back to the old house to grab a load of stuff or clean, I was in tears. We said goodbye to the house for the final time on Monday morning. We took Isabella over to look at the empty house one last time, and to say goodbye to our neighbors. As I was driving her back to our new house, I was trying to keep my tears to myself, but she noticed. She kept telling me, "Take a deep breath, mommy. You'll feel better." The new house is nice, but there have been some unexpected problems. The dishwasher does not work. The outlet into which our chest freezer is plugged in the basement suddenly stopped functioning, and thank goodness I went to get something out of it yesterday morning or else we would have lost a freezer full of food for the second time in six months (this happened at our old house when the freezer came unplugged). We cannot figure out how to de-program the thermostat to prevent it from dropping the temperature of the house to 60 degrees every night (it's been in the low 30s here in NY overnight). And there are some plumbing issues as well. There was also major last-minute drama with the loathsome couple buying our house. Email me if you want the details, because as much as I would like to flame them publicly and by name, I value my freedom and my pumpkin spice lattes from Starbucks too much to do that right now. 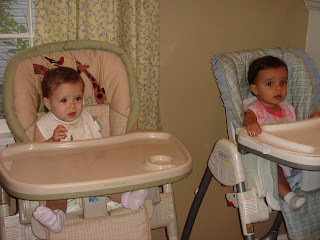 And tomorrow, the twins turn 1 year old. 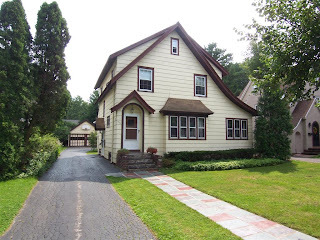 Nine years and five months ago, in May of 2000, a 1925-built, three-bedroom colonial with leaded glass windows, crown moulding, a fireplace, a breakfast nook, a screened-in porch, and a small in-ground pool went on the market. We were the first people to look at the house. I was 24. The hubs was 28. We had been house-hunting for awhile. The real estate market was crazy in my area at the time. We had been outbid on two different houses in the same town by people bidding over asking price. Our agent at the time got us in to see the house before anyone else did. We fell in love with what we saw, and put in our offer that night. It was accepted the following day. Two months later, we and our three cats moved in. A few weeks later, we were engaged. Although we had been living together in an apartment for two years prior to buying our house, this home...this home that we both love so dearly, is where we truly began. 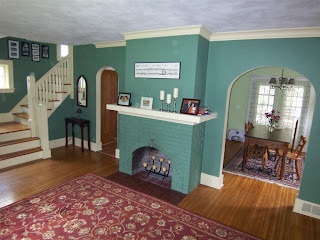 This is the living room whose paint color I chose and which everyone, including the hubs, told me was hideously dark and would make the room look smaller. I held my ground (shocking, I know) and we have received compliments on the color from the naysayers from the day it went on the walls. 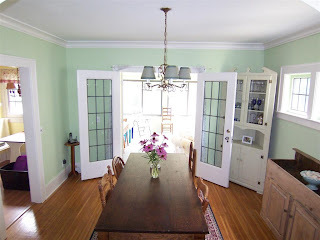 This is our dining room, the room that held the table at which the hubs and I sat to play hundreds of thousands of games of Scrabble, at which I usually wiped the floor with him. This is the ottoman in our living room on which four years ago I sat sobbing my eyes out while a nurse told me over the phone that after two years of trying to conceive, multiple IUIs, and one IVF, Isabella was on her way. 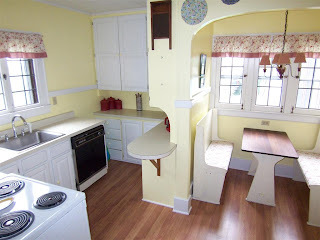 This is my kitchen's breakfast nook, one of my favorite spots in my house, where two years later I sat in utter disbelief upon hearing that my FET had, indeed worked, and that I was pregnant once again. 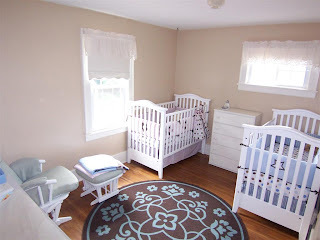 And this is the room we brought her brother and sister home to (although admittedly, it looked more like this until the twins were about 4 months old). You all know why I love our house so much. And yet on Tuesday of next week, it will no longer belong to us. We're moving today and renting our new house for a few days before closing on the sale of our house and the purchase of the new one. I am shipping the kids over to my grandma's this morning so she and my aunt can watch them for the day. And then I will return to my house of nine years, load up the truck with the boxes containing my life, and move them to a house that's as foreign to me as another planet. It will be awhile before the new house becomes a home. Yesterday I was in the new house alone for the first time. I was waiting for someone from the company we had clean our house on Wednesday to return and fix the faucet one of the staff had inadvertently broken. I was moping around the empty house, and while I was a bit excited about the space in this new house, what I was really thinking is that this house was not my house. I looked out my bedroom window, and in the backyard a female deer was lounging under a tree. My house is in a suburban neighborhood very near the city, and nowhere near a park or forest or anywhere you might normally find deer. But more interesting to me than the sight of a deer chilling out in my backyard was the fact that a single ladybug was clinging to the glass on the outside window pane. So that either means that I'm pregnant again (God help me, and also completely impossible), or it means that while I am going to miss my old house and my neighbors (especially my incredible next-door neighbors) terribly, everything is eventually going to be alright. Oh, fun! Laundry! Can I play? Am fierce like cougar and quick like jaguar. You're just lucky mommy ran out of my Lee Press-On Nails, little brother. Having your big sister fight your battles for you now? What a wuss. I'll take that binky, and the quart of drool that's coming with it! I will laugh while you cry and feel no shame. And no jury in the land's gonna convict this face, sucka. 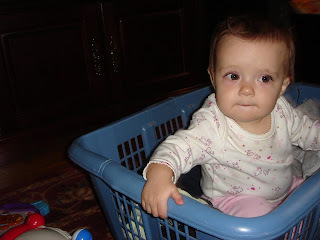 Part I of the Binky Chronicles can be found here.